That morning, I took out all the bobby pins and it ended up looking like this. To break apart the curls, I ran my fingers through them and pulled them apart into pieces. 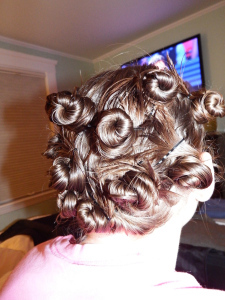 If the curls are too crazy, you can tame them by putting on a headband or using a barret. Either way, you have a curly hair day!